Cryptic: Explorable Star Trek Online Ships is "Something We Want"
Cryptic Studios says it eventually wants to let players explore the one big part of Star Trek Online where they currently can't boldly go at all: Their own starships. Remember that TOS episode when Lt. Riley got all hopped up on astro-goofballs, put the Enterprise in peril by shutting down its engines and then drove everybody nuts by belting out off-key renditions of "I'll Take You Home Again, Kathleen?" That's the kind of problem that has only one solution: Go down to Engineering, bust open the door and punch somebody in the mouth. But while that might have worked for Kirk, it won't work for you, for one simple reason: You can't go down to Engineering, or anywhere else in your Star Trek Online starship, for that matter. Not yet, anyway. "Anything we can do to make the game feel even more like Star Trek is something we want to do. 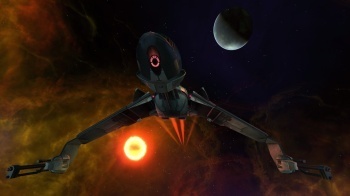 So, definitely, we want to give people more of their ship," STO Executive Producer Craig Zinkievich told IncGamers. "This is one of those things we want to get perfect before introducing it to players, though. It's going to be an undertaking." It's unlikely that a full-scale mockup of the Enterprise is on anyone's drawing board at this point but even just the ability to move between the major stations on a ship - Engineering, Medical, perhaps even the thrice-damned Holodeck - is high on just about every player's want list. The addition of customizable crew quarters and locations like Ten Forward, meanwhile, add all sorts of possibilities for extra social gameplay options. Integrating all of that into the game might be tough but the depth that could potentially be added as a result, not to mention the increased appeal to Star Trek fans, is difficult to overestimate.